If you're going to Left Coast Crime in Santa Fe next week, you should be planning your side trips (or maybe you signed up for the LCC tours?) or even walking tours in between sessions. Have a look at The Santa Fe Traveler. They specialize in providing excellent, personalized concierge, trip-planning and destination management services to people visiting Santa Fe. You'll definitely want to consult The Santa Fe Traveler's Blog for Walking Tours. Following are links to three Walking Tours of Santa Fe--well, four if you count Chocolate! Santa Fe is a treasure trove of historic places waiting to be discovered. The four hundred year old city, originally named La Villa Real de Santa Fe de San Francisco de Asis, (The City of the Holy Faith of Saint Francis of Assisi) is the oldest capitol city in the United States. It is also the highest at 7,000 ft. above sea level. A great way to get a feel for the history of The City Different is a walking tour around the historic Plaza area. Read the Rest of the Article, HERE. The Cathedral Basilica of St. Francis of Assisi was built in 1869 at the behest of Archbishop Lamy, later memorialized by Willa Cather in her classic novel Death Comes for the Archbishop. The building is a blend; traditional elements found in a Catholic church meld with uniquely New Mexican touches. Read the Rest of the Article, HERE. A walking tour of Santa Fe would not be complete without a stroll up this almost mile-long street. Read this article HERE. Of course you knew this would be here. Billie Frank at the Santa Fe Traveler has this post on her blog and at my other blog: DyingforChocolate. Either way, it's going to be a chocolate-y Left Coast Crime! Very useful information, Janet! I hope to escape from the Left Coast Crime activities at least once a day to take a walk outside and renew and refresh. I'm going to go to the site now to print a lot of the tour summaries. Thanks! Thanks, Janet! I had seen that chocolate tour, and even mentioned it to some friends. Chocolate, here we come! 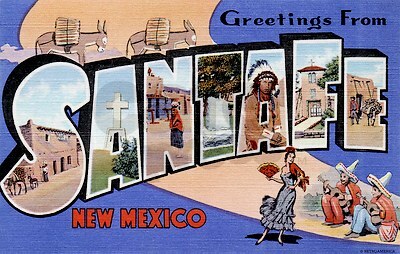 Thanks for linking to our Santa Fe Travelers blog! 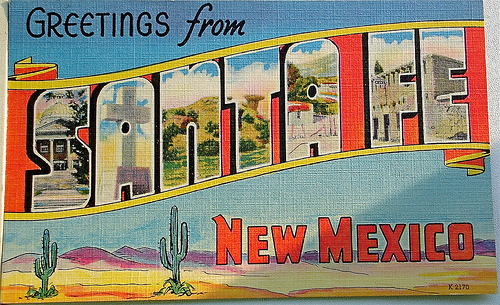 Hope all the Left Coast Crime folks have time to explore and discover the magic of Santa Fe. Thanks, Janet! I'll be in New Mexico on vacation, but I'm taking one day (Saturday) to mingle with you all at LCC. I'm so excited!! Becke, can't wait to meet you! I'll be there on Saturday. Are you coming to the banquet? If you like abstract sculpture, and have a car, it's worth a quick trip up to Shidoni, still in Santa Fe but away from Canyon Road, for the outdoor sculpture.Shidoni has a famous artists' foundry you can see in action. Check out Tim Rose's mobiles in the gallery too. Full disclosure: Tim and I were S.O.s until his death a few years ago. What fun! I am going to have to get out more to see those Santa Fe postcard suguaro cacti! See you soon ... next week? Yikes, gotta get the Pocket Program done soon, eh?